The GT Sport Cross-Country conquers the Barrier Ranges and proves it's an offroad star! 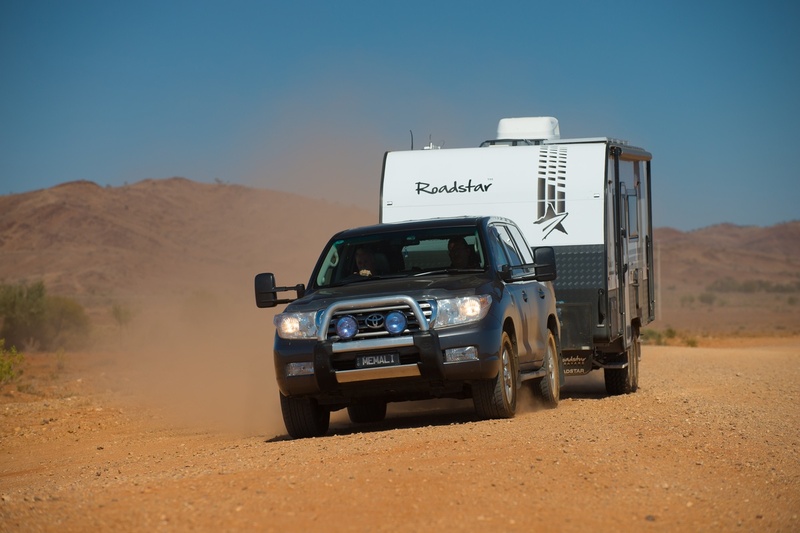 Roadstar Caravans head honcho Ken Nizam certainly didn’t mollycoddle his entry-level offroader—the GT Sport Cross-Country—at the recent AL-KO ‘Toughest Tow Test’. In fact it was quite the antithesis as, without being gung-ho, Ken was hell-bent on taking things to the limit. Ken was every inch the leader of the pack; and his enthusiasm was infectious! I accompanied Ken from his Somerton HQ in Victoria, staying overnight in Mildura before journeying on to historic Eldee Station in Silverton, NSW—the base camp for AL-KO TTT. The 5.93m (19ft 5in) GT Sport Cross-Country was so super silky traversing the bitumen highways of regional Victoria that I hardly detected it was tacking on behind Ken’s Toyota LC200. 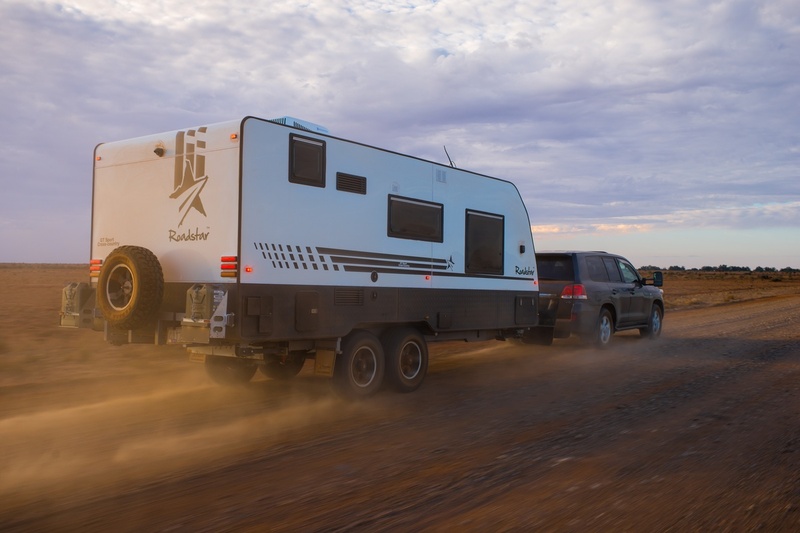 But this extraordinary van’s ‘tour of duty’ really commenced when a six-caravan convoy took off in perfect formation from the Eldee Station Homestead to access the rugged Barrier Ranges and its surrounds, including over 100km of 4WD recreational tracks. And I was duly impressed with its bulletproof feel and sheer agility as it went tete-a-tete with a true outback oasis and its unforgiving environment. 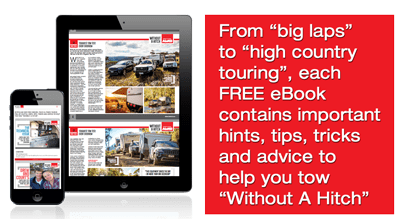 This go-anywhere van certainly cut the mustard during its litmus test over the tough terrain and undoubtedly proved it’s no ‘cotton-wool champ’. It was as though this Roadstar was in familiar territory. And its clinical execution up and down the steep rocky terrain was simply ultra-impressive. The GT Sport Cross-Country handled the uninviting conditions on its ear! There was plenty of shake, rattle and roll but its robust and sturdy exterior and interior remained totally intact. It also ploughed effortlessly through the seemingly endless sand dunes of the Mundi Mundi Plains—and the entire process didn’t even ruffle the bedspread! What’s more, there was absolutely no dust ingress—you couldn’t find a speck of debris inside. There’s no disputing the GT Sport Cross-Country’s full offroad credentials courtesy of its 3.7t-rated AL-KO Enduro Outback independent trailing arm coil spring independent suspension with twin shock absorbers, plus a sturdy SupaGal chassis (4in main rails, 4in raiser, 6in A-frame)—made from premium BHP steel—and 16in alloy wheels fitted with 12in electric brakes and heavy-duty mud-terrain tyres. The chassis is also gusseted and reinforced in all the right places with good quality welds. Yes, this van’s leading edge underpinnings are a great foundation—a formidable backbone! 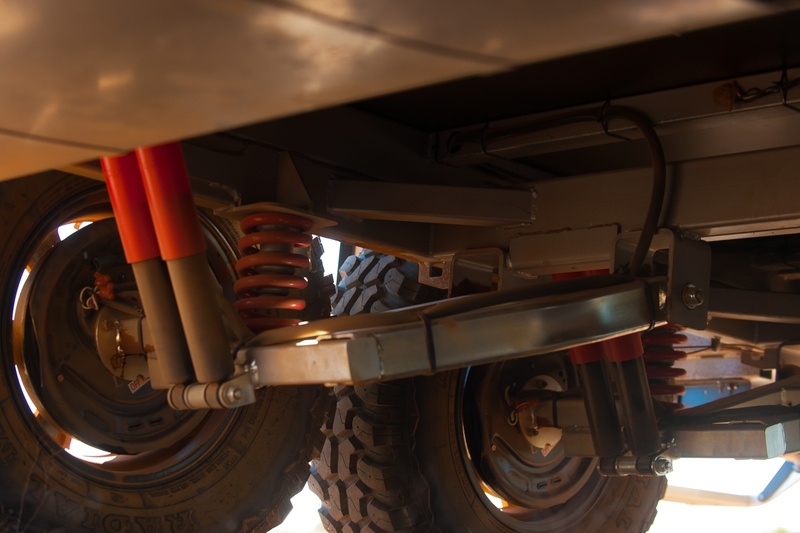 And you’ll really appreciate the additional ground clearance when encountering genuine offroad conditions. Further, it also came with an AL-KO ‘Click Lock’ offroad pin coupling which provided amazing articulation. The only thing missing in the ‘pillar’ equation was AL-KO ESC, but Ken was quick to advise that sway control is optional. 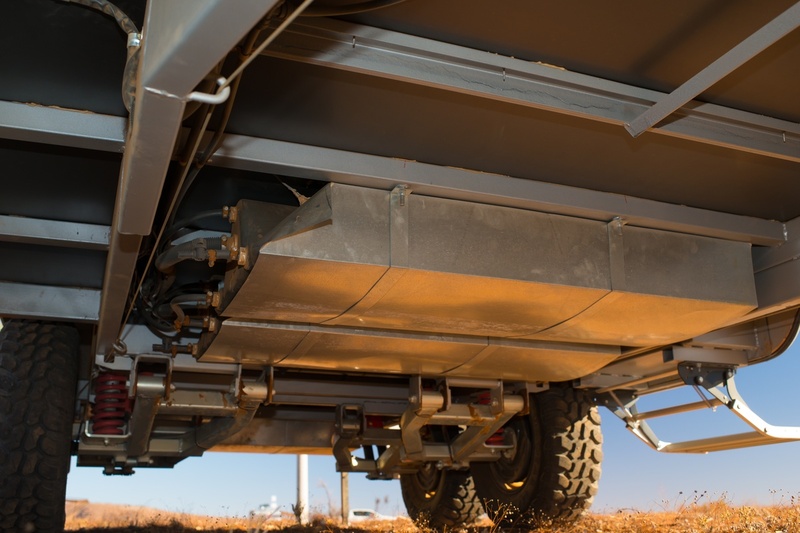 This imposing Roadstar is a relatively light offroader for its dimensions, with a Tare weight of 2450kg and a healthy 600kg payload. Intrinsically, the GT Sport Cross-Country has no off-grid limitations—water 2x95L (fresh), 1x95L (grey); battery 2x120Ah AGM; solar 2x150W; and an exterior shower with hot and cold running water. However, I wouldn’t mind a slide-out barbecue or similar thrown into the mix for al fresco-style cooking out in the fresh free-camping air. External protection and storage also comes to the fore given the van’s strapping stone shield with extra-large heavy-duty mudflaps, which safeguards the twin 9kg gas cylinders, along with a full-width tunnel boot and a voluminous toolbox with a generator slide. 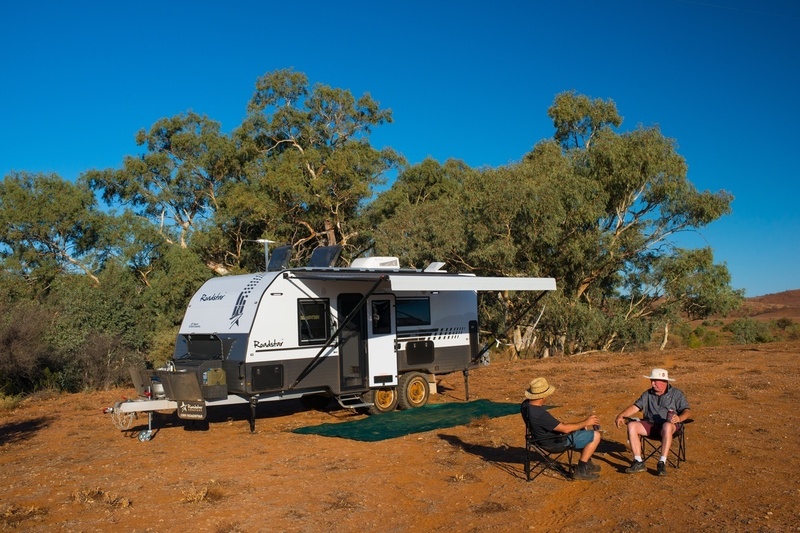 Also onboard on the outside are a rear-view camera, exterior shower, with hot and cold running water, fold-down picnic table and Carefree roll-out awning. Meanwhile, the van’s modish internal finish emits a certain grandeur and exemplifies the Roadstar polish. All in all, the spacious and stylish interior of the GT Sport Cross-Country epitomises the company’s hallmarks of up-to-the-minute decor infused with precision quality of finish. It’s full-on eye-candy! I appreciated the CNC-cut and designed furniture with heavy-duty adjustable-cup hinges, and the premium acrylic-finish lightweight all-ply cabinetry complemented by modern, soft-glow LED lighting. And the high-end appliances also include quality Dorset latches. Equally, I liked the glossy contrast between the matte stainless steel finish overhead cupboards and charcoal laminate lower cupboards. Plus all the cabinetry fits like a glove, hence there’s no gaps. And then there’s the exclusivity of the flexible, instantly binding MS polymer adhesive sealant from Belgium, which increases the van’s resilience. I simply loved the palatial and spacious bedroom with its panoramic double-glazed Euro-style windows and copious storage all round. 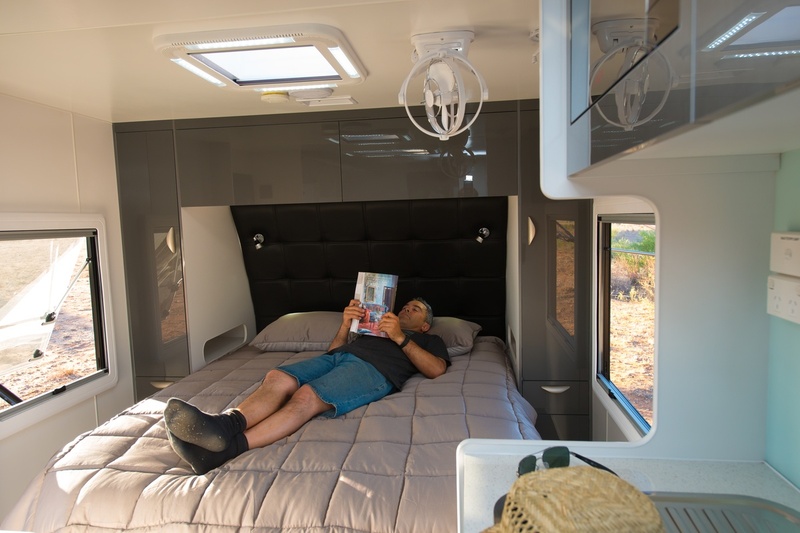 And the caravan-queen-size bed with deluxe innerspring mattress emits an air of total relaxation. Meanwhile, the galley is more than capable of producing mouth-watering meals while out yonder. 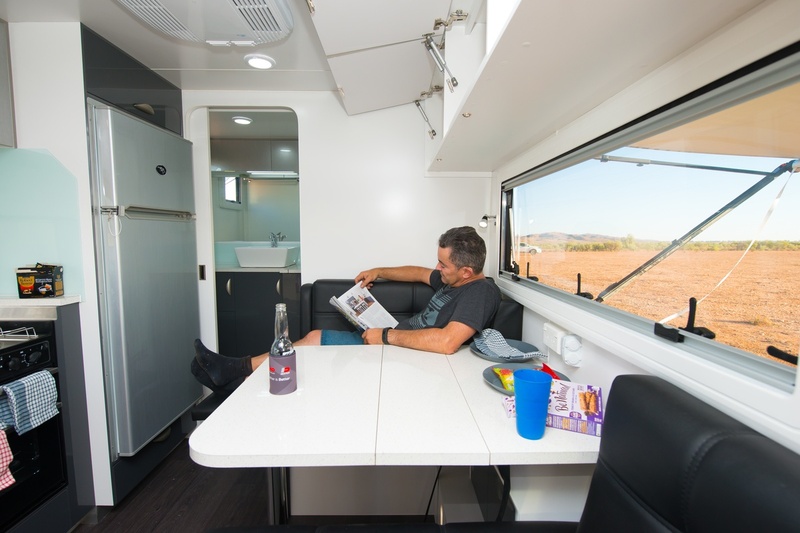 The good-sized fully functional kitchen, with generous benchtop space, comes complete with culinary amenities such as a Swift four-burner cooktop (gas), grill and oven, 210L Evakool 12V compressor fridge and a Swift Dluxx microwave. Not to mention the impressive aesthetic of a commercial grade acrylic kitchen splashback. 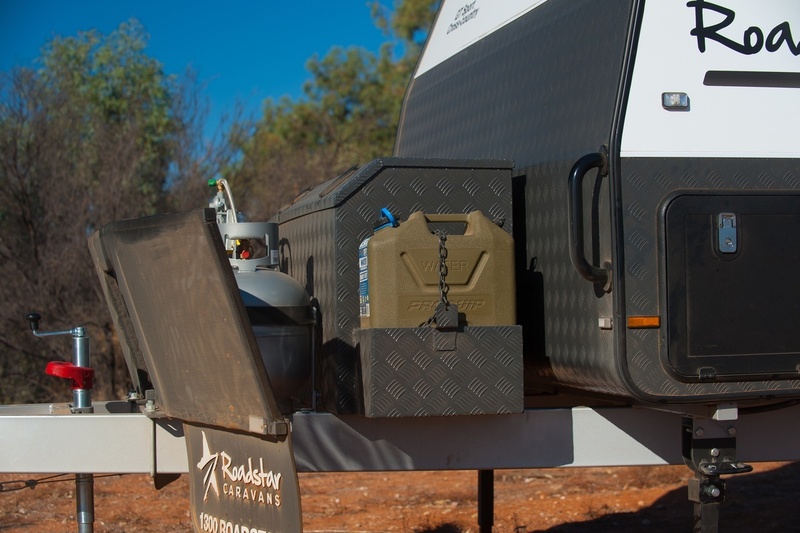 Additionally, the 12V compressor fridge is ideal for off-grid expeditions and its gargantuan 210L capacity certainly reduces the number of trips required to restock camping supplies. And the decent-sized Annahide-upholstered cafe dinette exudes panache and melds perfectly with the interior colour theme. 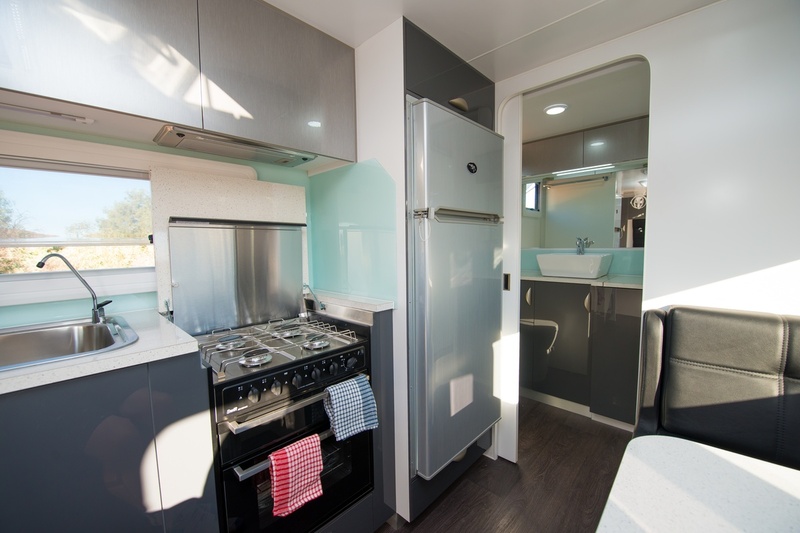 The exquisite full-width rear ensuite comprises all the necessary mod cons and more including a modish vanity with chic ceramic bowl, fully-moulded one-piece fibreglass shower cubicle and Thetford C223 cassette toilet. And a recessed top-loading 3.5kg Destination RV washing machine will prove a godsend while out in the sticks! 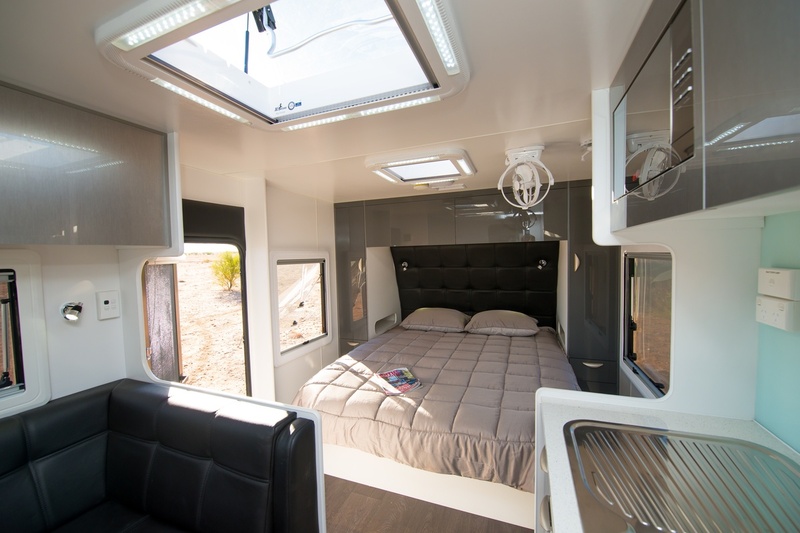 Good-sized hatches allow plenty of natural light and ventilation, and a roof-mounted reverse-cycle Finch air-conditioner provides refreshing climate control. In-house entertainment comes in the form of a wall-mounted 24in HD LED TV with built-in DVD player, supported by a digital boosted antenna, and a Pioneer CD/MP3/DVD sound system with remote control. And it comes as no surprise that everything is compatible in the electrics department (Ken says Roadstar doesn’t “mix and match” its electrical suite). This GT Sport was laden with the Cross-Country Pack—3mm aluminium composite panel to side walls, front wall, rear wall and roof; large toolbox with storage, generator slide and jerry cans; external shower; pressure hatch; extended A-frame with centre T-piece strengthener; front stone protection shield with extra-large heavy-duty mudflaps for added protection. Roadstar justifiably talks the talk with its offroaders (and its entire fleet), and this one certainly walks the walk! Quite simply, boasting immense structural integrity, it refused to wave the white flag. Indeed, the GT Sport Cross-Country is purpose-built for off-the-grid living and handling the rough stuff. 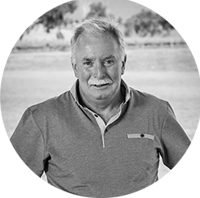 It reflects over 30 years’ experience of design and engineering nous. And, approaching high-end status, it’s no ordinary entry-level offroader. Alright, it doesn’t pretend to be in the exalted realm of Roadstar’s ultimate offroader—the flagship Sirius—but then again it doesn’t command a top-end price tag. This exemplary Roadstar will take you cross-country and beyond for extended periods with peace of mind and in complete comfort!